Harley Davidson Zone offers a complete selection of Harley Davidson luggage and saddlebags along with mounting brackets and hardware. Also supporting other major makes and models with the same products. Order genuine Harley-Davidson parts and accessories at up to 20% discount from retail prices. If you're looking for reliable, safe, and secure parts service for Harley Davidson motorcycles, you've come to the right place. Find discounted Harley-Davidson accessories designed for your motorcycle in our online catalog by selecting your model or just enter part numbers from your copy of the Harley-Davidson Parts and Accessories Catalog available at most Harley-Davidson dealers. You can also order a parts and accessories catalog online. If you don't know the part number, enter a description of the parts or accessories in the "keyword search" and we'll try to find what you are looking for, all at discount prices. Harley Davidson bags are the most popular motorcycle saddlebag solution due to the high quality of our bags. All of our saddlebags are made of heavy-duty cowhide leather. In order to ensure that our saddlebags do not sag, we further reinforce our leather and synthetic leather bags with powder coated steel frames. Other prominent features include: Ability to lock, come with quick release buckles, they are motorcycle specific, and we have recently added a line of colored bags. Our color saddlebags for Harley Davidson and Honda motorcycles have quickly gained popularity among motorcycle riders in North America. When buying motorcycle luggage one must keep in mind the following: As you know most motorcycles do not come with bags. As a result, motorcyclists have to make sure that they buy bags that are motorcycle specific. The term 'motorcycle-specific' means that the bags do not need a turn signal relocation kit in order to be mounted. Motorcycle riders who have experience with relocating their turn signals would tell you that it is tedious task. The second dilemma most motorcycle riders face after buying motorcycle saddlebags is the unavailability and/or price of the mounting hardware. We at Harley Davidson Zone believe in offering our customers a complete motorcycle luggage solution. For this reason, we offer mounting hardware for every set of saddlebags we sell; we also include easy to follow mounting instructions. The third important factor to consider when shopping for a motorcycle luggage solution is the security of your personal belongings. Harley Davidson bags have met this challenge by making most of the bags lockable. The fourth aspect to consider is the access to the bag. During the '80s and '90s, the motorcyclist had difficulty accessing their motorcycle saddlebags because the traditional leather bags were not equipped with quick release buckles for easy access. This is why all Harley Davidson Motorcycle Saddlebags are now equipped with quick release buckles for easy access. Finally, consider the strength and durability of the motorcycle saddle bags. These bags must be able to survive harsh weather, not to mention the moisture it endures from fog and rain. Motorcycles are made of metal but the luggage is made of leather, this is why is important to make sure that the bags you buy are reinforced with steel. All Harley Davidson are super reinforced with powder coated mild steel frames. This prevents the motorcycle luggage from sagging. We work hard to bring the best luggage & Saddlebags solutions to our customers. Motorcycle Saddlebags: Are one of the most dependable ways to store and protect all your necessary items for hitting the open roads, whether it is for a Sunday cruise or a wild week in Sturgis. Leather Saddlebags: Are a great way to spruce up your motorcycle and give you the added storage you desire. With a vast number of styles and sizes to choose from, your options are endless. Leather saddlebags are also a great way to keep all or your personal belongings safe from the harsh conditions you might encounter on the road. Vinyl Saddlebags: Give your bike the look of leather without the paying the price of leather. Synthetic leather technologies have increased rapidly, buyers are now demanding quality leather replicas, and this is exactly what you'll find with a new line of quality vinyl saddlebags. Just like genuine leather saddlebags, vinyl saddle bags give you the look and feel of real leather, but with less up-keep and maintenance, as well as that finished look and storage you are after. Bolt on Motorcycle Saddlebags: Are attached directly to your bike. Most bolt-on styles come with mounting brackets or can be ordered separately. Bolt on saddlebags are fairly easy to install and add a level of customization above all others. Saddlebag brackets include stainless steel bolts, and mounting brackets, so you don't ever have to worry about rust or corrosion. 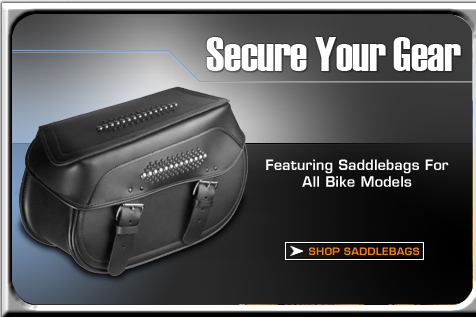 Bolt-on style saddlebags are an excellent addition to any ride, and are available for most bikes. Throw-over Motorcycle Saddlebags: Are one of the easiest ways to add extra storage to your bike without using any kind of mounting brackets. These saddlebags are great for just about any application, with its easy on/off system you can easily take your valuable possessions off of your bike very quickly. No more locking up your saddlebags and worrying about theft, just unsnap, unzip, or unbuckle your motorcycle saddlebags and take them inside with you. Buy Harley quality motorcycle saddlebags for your Harley Davidson for less here. Why pay over $400 more for the same quality saddlebags at the Harley Davidson dealership just to get a pair of bags that say Harley Davidson? You've already got a bike that says Harley Davidson...right? Harley-Davidson and H-D are trademarks of Harley Davidson Motor Company Inc. registered in the U.S. and other countries.